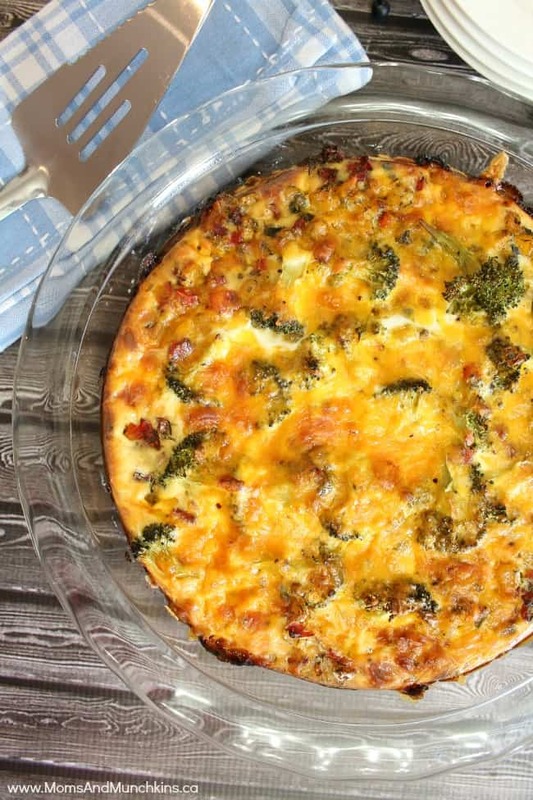 This easy quiche recipe is perfect for a Sunday brunch or for a weeknight supper. It’s really easy to make and it tastes delicious! This easy quiche recipe is perfect for Sunday brunch. This recipe makes 1 9-inch quiche. If you want to make two, then make note of the notes in (brackets). Place parchment paper over the frozen pie crust. Place a large handful of dry beans on top of parchment paper to prevent crust from bubbling up. Place pie crust in oven on the lowest oven rack and brown for 8 minutes. Carefully remove parchment paper and beans (after the beans cool, you can place them into a plastic bag to use again next time you make this easy quiche recipe). In a large frying pan, saute the onion, corn, red pepper, ham and dill weed. In a separate bowl, whisk eggs and evaporated milk. Remove sauteed vegetable & ham mixture from stove. Stir in flour. Pour vegetable and ham mixture into the pie crust. Mix ½ of the shredded cheese into the egg and milk mixture. Add salt and pepper into the egg mixture. Pour egg mixture over the pie. Bake on bottom rack of oven for 45-50 minutes (until a table knife inserted in the middle of the pie comes out clean). Remove from oven & let cool for 10 minutes before serving. This looks like the recipe my fiance would dream of me making. Consider it bookmarked and favorited! Oh this looks yummy. I must admit we do not do many quiches but i would love to make this one! I haven’t had quiche in forever. This recipe looks hearty and delicious. Pinning now. Wow this does seem super simple. Will add to my pinterest board. I hate to say it but I have never had quiche, but sure does look yummy. This looks so good! I think I will try it this weekend. Thanks for sharing! This looks delicious! We usually only make quiche for Christmas, but I think I need to make this much sooner! This looks great! I love quiche and my family does too but it’s been a long time since I’ve made it! Thanks for linking up your recipe at my homemaking linkup! Thanks for the recipe. Never made Quinche going to try this out with my family . I tried this recipe tonight (without the Dill and ham) and it was amazing! I didn’t have a pie tin, so I used a cupcake pan and made mini quiches by cutting out little circles of dough for the pan! 5 stars, will definitely make this again! Hi Rachel! Thank you so much for your feedback. This is one of my favorite recipes! Now I’ll have to try it in mini form too!